For about the 1000th time in one day, the top of a French roll is lifted with a pair of tongs and deliberately dipped in a steel tray full of 'au jus,' a rich mix of vegetable and beef juice. Practiced hands have layered exactly 4oz of sliced roast beef on the bottom of the roll. The wet top of the roll is placed over the beef. The sandwich is sliced diagonally. 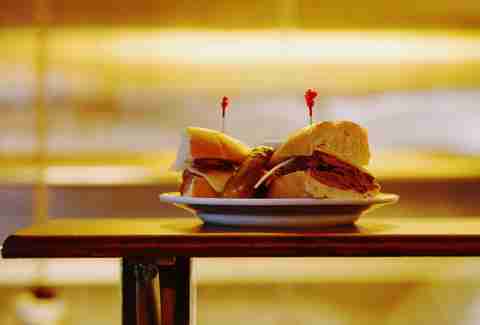 So goes another French dip sandwich -- arguably Los Angeles' most iconic dish. 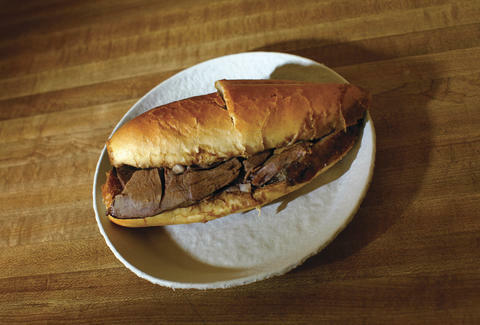 In spite of the name, there is actually nothing French about the French dip. 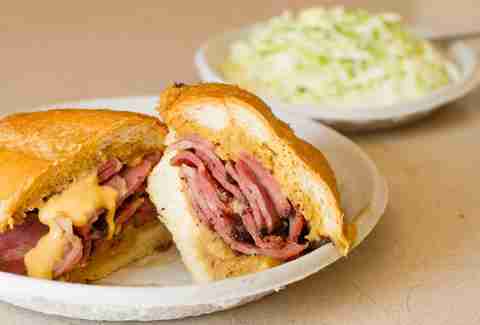 The sandwich was definitely invented in Los Angeles in the early 20th century. Two classic LA eateries make competing claims as originators of the French dip, but the closer that you look at those claims, the hazier they become. 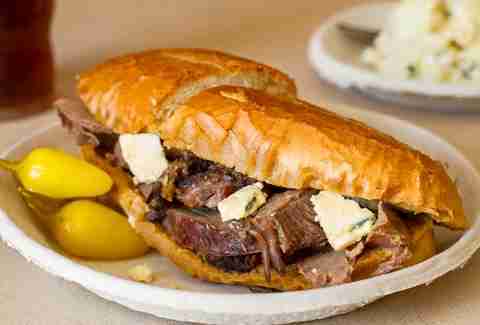 In fact, look close enough -- and you'll start to doubt what a French dip really is in the first place. The highest-profile claimant is easily Philippe's, founded by Philippe Mathieu, a French immigrant born in 1877 who started out at a deli in Southern France before moving to Algeria to work as an apprentice cook. He spent a year in the French army and then saved up enough money to immigrate to the United States, where he cooked in American lumber camps and hotels -- and by 1903 he had made his way across the continent to Los Angeles. For $150 he bought himself a delicatessen at 617 Alameda, the first in a series of businesses that Mathieu would open in the neighborhood. He opened Philippe's Restaurant in 1908. And if you believe the legend, it was there that the first French dip was made. That’s just the first example of Philippe's owners seeming unsure of their own story. In fact, Philippe Mathieu's own grandson told yet another version. “One day a fireman complained that his roll was stale,” Philippe Guilhem told the LA Times in a 2008 interview. “It was probably a Monday and the roll was a leftover from the weekend. My grandfather was a thrifty person. He said, 'Give me the damn thing back.' He dipped it in the juices and said, 'You happy now?'" With a deliberate -- even vindictive -- first dipping, that sounds very different from either version of the story that Philippe's current owners are telling. But while he was closer to the source than Philippe's modern management, Guilheim was still telling a story that was at best second hand and already around 90 years old. The actual closest that we can get to the horse's mouth is a 1951 LA Times interview with Mathieu. The article was written on the occasion of Philippe's relocating to make way for the Hollywood Freeway. The sandwich was born and awaited its dip. "Then we started making French-roll sandwiches for those who had smaller appetites," Mathieu said. "One day a customer saw some gravy in the bottom of a large pan of roast meat. He asked me if I would mind dipping one side of the French roll in that gravy. I did, and right away five or six others wanted the same." No firefighter. No tantrum at a demanding customer. No my-chocolate-in-your-peanut-butter moment. Everyone from Emeril Lagasse to Adam Richman will be horrified to hear that the original French dip sandwich was not roast beef at all but rather appears to have been pork. It may even have been dressed with pickles, onions, and olives. But what about the name? The easy answer is that Mathieu was a French man in a city where his nationality was probably his most notable characteristic. It was a “French dip” because the French guy dipped it. But “French dip” was also probably a pun. Around 1898, women's fashion advertisements began promoting dresses with what was referred to as a “French dip” -- a drop in the waist of a dress to below the belt. The fashion-French dip became extremely common and appeared in hundreds of newspaper advertisements for dresses and then later as a feature of both men's and women's jackets, lauded as a slimming feature that gave the wearer a thinner appearance. Therefore, the name of the sandwich was probably a double entendre. It was a nod towards the nationality of the man who was making the sandwiches and to the fact that it was dipped in juice or gravy, but also poked fun at the fact that a gravy-laden pork sandwich is about the last thing that is going to slim down a waistline. But Beheshti was born in 1941, and records indicate that he bought Cole's in 1989 -- in other words, he had no first-hand knowledge of what bread fell in what juice in 1908. Days of searching through newspaper records produced not a single mention of a French dip sandwich at Cole's prior to Philippe's developing a reputation for them. No interview with either Henry Cole or the nameless chef has been recorded. The entire body of evidence seems to be an oral history passed down among employees, which makes for a weak claim compared to Philippe's. 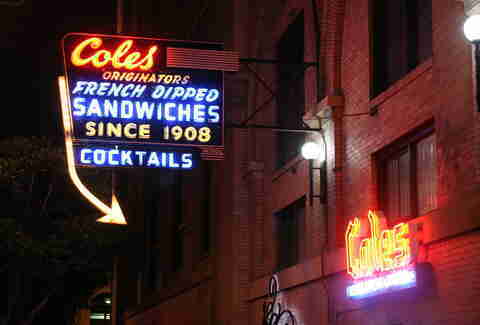 The current owners of Cole's have no historical connections to either Henry Cole or his staff. Among each of the competing stories about the invention of the French dip, the version told by Philippe Mathieu in 1951 is by far the most historically convincing. Versions of a story that are more tidy, compact, and camera-ready should generally be viewed as historically suspect. Mathieu's story seems more likely to be accurate because it avoids a satisfying 'eureka moment' cliché. It is also a first-person account, unlike every other version. The idea of Philippe's history is as much what they are selling as the (admittedly delicious) sandwiches. Walk into Philippe’s and you are presented with a carefully constructed old-time experience. The floor is covered with sawdust in the style of old-fashioned saloons a la McSorley's Old Ale House. But is “Philippe's The Original” really the original? Only if you order your French dip filled with roasted pork (which is an option, along with lamb and turkey) and topped with pickles, onions, and olives.